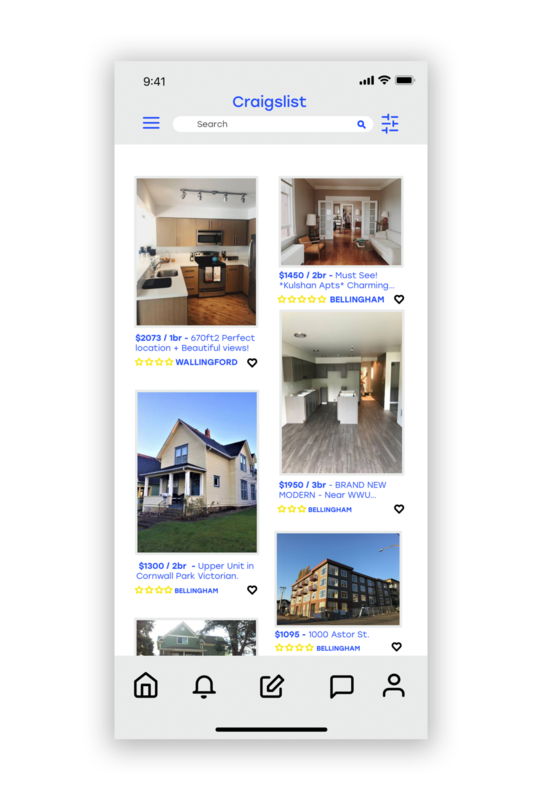 CAN CRAIGSLIST ADAPT TO THE MOBILE EXPERIENCE? Craigslist was founded by Craig Newmark in 1995 on the principles of community and simplicity. Since then Craigslist has blossomed into a multi billion dollar company with a global audience. However, do those values still uphold today? 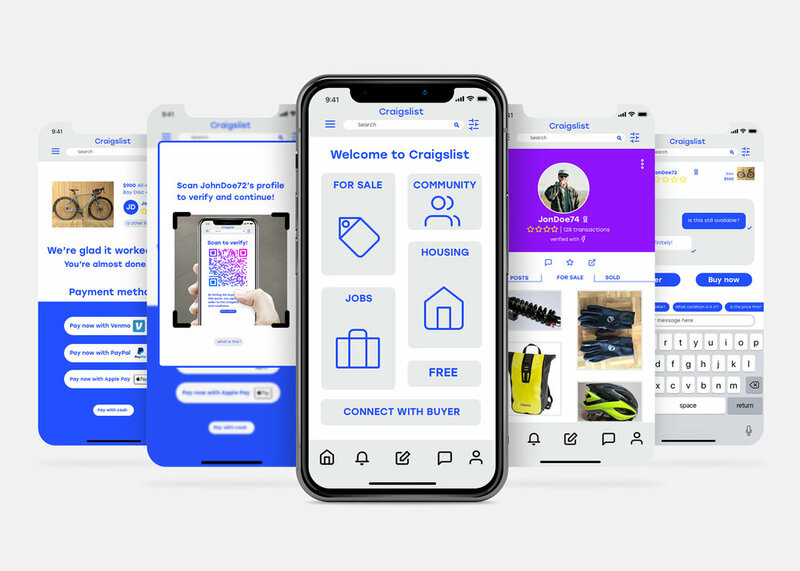 While Craigslist is still a very popular platform today, the lack of improvement and updating has lead the platform to fall quite short of the constantly evolving modern technology. As time has passed, technology and user experiences involving personal communication, transactions, and security have changed drastically. Over the years Craigslist has formed a stigma for itself that is dated, hard to use, and most importantly, unsafe. Our teams goal was to bring the feeling of community and trust back to the forefront of the platform, update the products features to match modern user to user platforms, and make the product easier and more convenient for to use. The first step in our process was to conduct a survey amongst a wide variety of craigslist users to identify specifically what the main issues with the platform are and to identify our demographic and target audience. 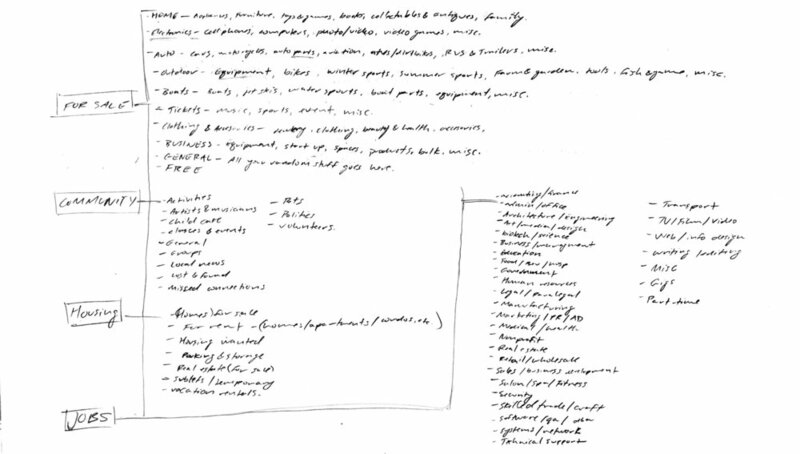 While these were the main pain points found in the survey, we found out more details to these pain points when doing personal interviews with a select few craigslist users. 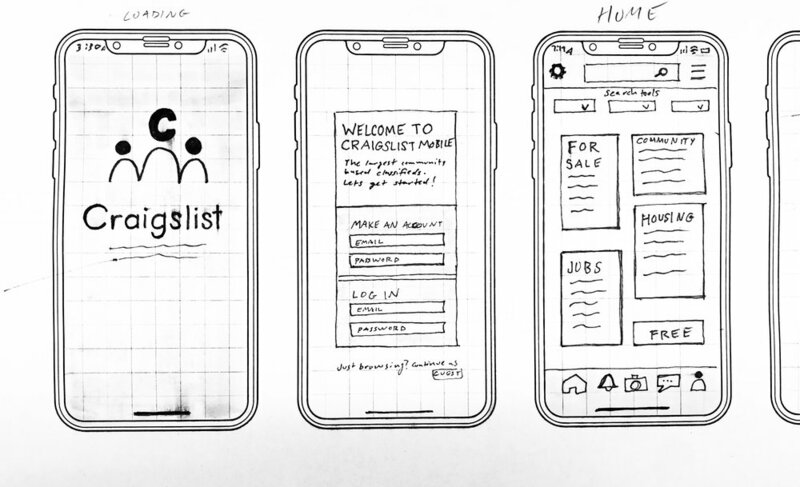 When interviewing a small, but diverse, group of users we found specific pain points like the lack of features Craigslist has, such as posts not disappearing when sold or no longer available. Other features we found users were missing were better ways to contact other users or to inquire about posts. Craigslists current platform does not have user profiles or in platform messaging, instead they use a dated encrypted email system that allows users to contact each-other via email which most users find annoying and ineffective. Lastly users were bothered by the payment methods, which are currently all done off site based on the two users agreement, which lead to scams, fraud, and distrust in Users. The main pain point that has evolved into a stigma for Craigslist is the lack of safety. With over thousands of scams, fraud, attacks, robberies, and even murders linked to the product, it was absolutely crucial to us to bring back a sense of security and safety. Many of the users we interviewed were dissatisfied with the lack of payment security the product provided. In order to create a useable app that is easy and intuitive for users, we needed to understand their process in using the current product and where they are challenged or stressed and where they succeed. By observing a users journey we learned what parts caused them stress or frustration, which we can then use to solve those very problems they had. Through our research and other personal experience we found that community buy/sell/trade platforms are on the rise right now. With new products like OfferUp, LetGo, and even Facebooks new Market Place feature, this type of platform is more popular than ever. It's important to understand who Craigslists competitors are and what they are doing well and what they are not. In order to understand these ideas, half of the research is just finding out what features theres products do and don't offer. We took a culmination of features and integrated them into the new product that combined, add safety and security to the platform. Our first solution was establishing user profiles that could then be verified with another form of social media (i.e Facebook). The user profiles help confirm that people are who they say they are and give other users a sense of who they're talking to and a more personal interactions. 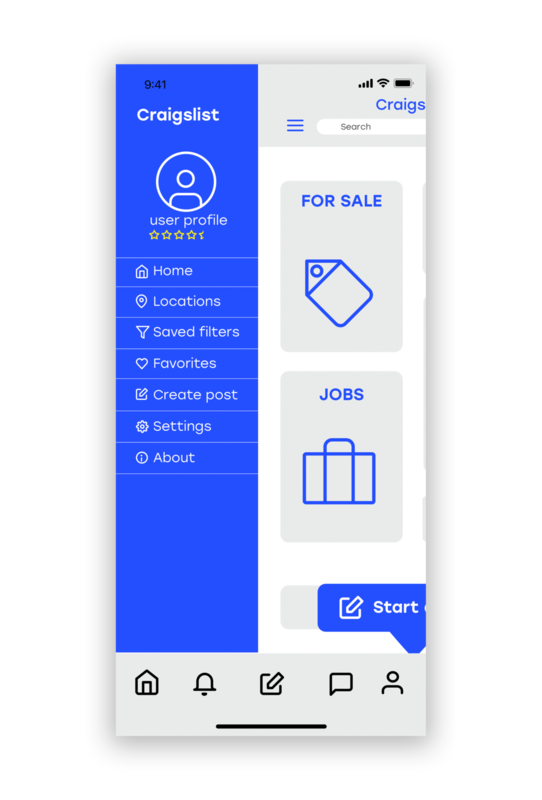 Another feature within our user profiles is a rating system, allowing users to rate or report sellers ands posters based on their conduct which creates consequences for scams while allowing users to avoid other users with low ratings for their own safety. Another new feature we developed was how to confirm the payment process. 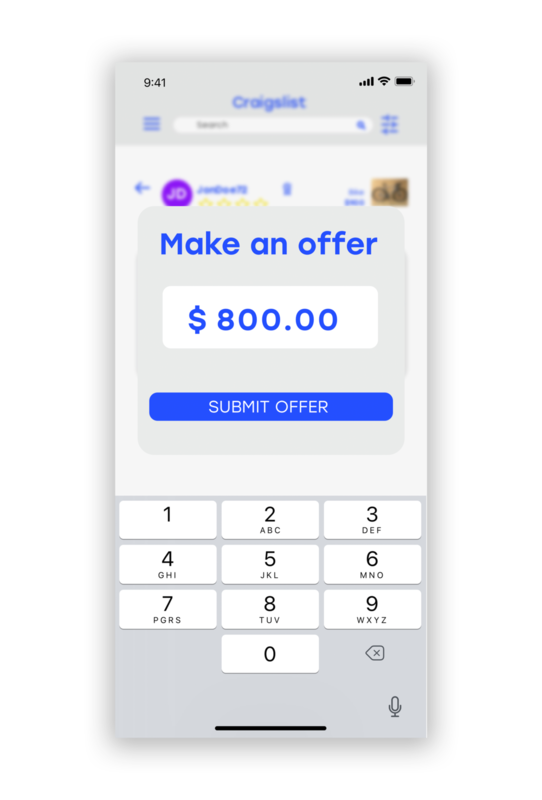 By creating a phone to phone QR scan, users now have to confirm they are with the seller and have seen the true product and agree upon it before paying via a secure payment processing product (i.e Venmo, Paypal, etc.) Through our research we found many users wouldn't trust a Craigslist brand payment system as of now, and would rather use a payment system they already use, but could see a Craigslist payment program being an option in the future. 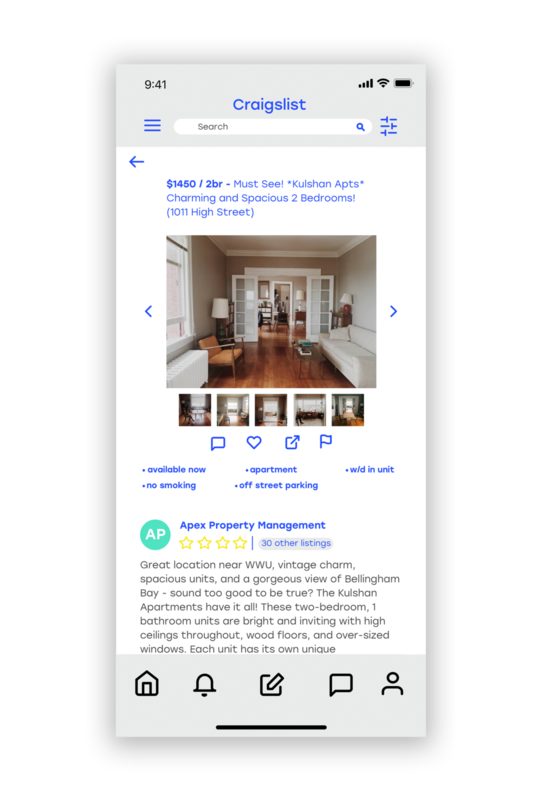 Since Craigslist has such a lack of visual design and hierarchy, it is was important to create a whole new UI that is user friendly, simple, and engaging to users. 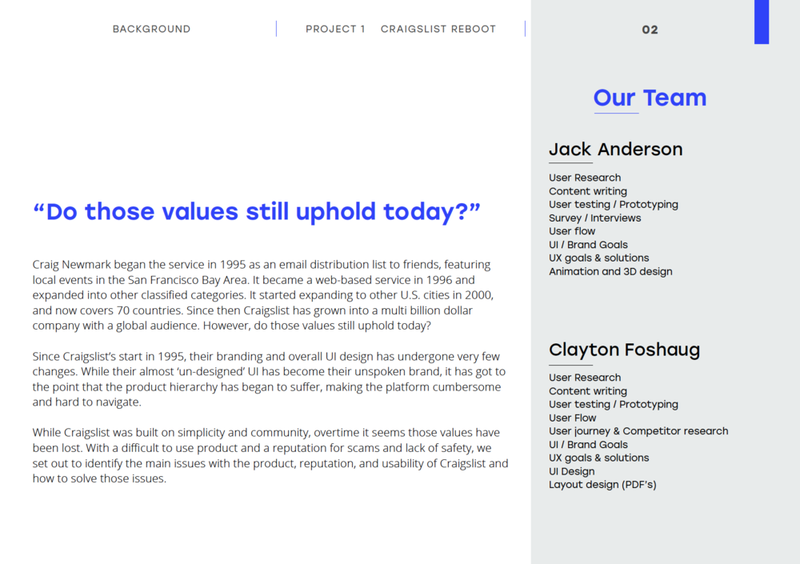 However we wanted to still incorporate the Craigslist almost cult-like undesigned UI as much as we could. Using a similar color palette and approaching the project with simplicity on the forefront we developed a clear UI that follows throughout the app, allowing users to browse casually without the stress points the original UI caused.